Beauty Sage, online at beautysage.com, offers beauty and wellness products proven to work. 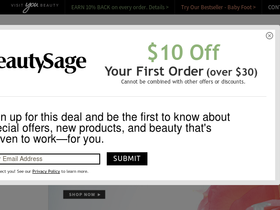 Beauty Sage is an online store by YouBeauty.com, the site created by Drs. Mehmet Oz and Michael Roizen designed to explore the science behind beauty. Beauty Sage continues on that thread, offering bath and body cleansers and scrubs, body moisturizers, eye care, sunscreen, makeup, nail polish, bath oils, bath salts, aromatherapy, fragrances, hair care, natural and organic beauty products, and more. Beauty Sage features brands like Kahina Giving, Shea Terra, Clarisea, 21 Drops, Joya, Suntegrity, Beecology, Historical Remedies, green babies, and lots more. But before you shop, get all the latest beautysage.com discounts, Beauty Sage promotions, and Beauty Sage coupon codes found here at RetailSteal.comm. Beauty Sage offers shipping via UPS. See site for more information. Get free shipping on your purchase from Beauty Sage. Enjoy discount with purchases $50+. Enjoy a free sample box from BeautySage.com. Click here and enjoy with purchases $75 or more. Get the Sample Box packed with editor's picks for only $5 from Beauty Sage. Click here to get yours today. Shop for natural bath and body products starting from $6 from Beauty Sage. Click here to shop Beecology, Bayberry Naturals and others. Shop for Kneipp mineral bath salts for only $19 from Beauty Sage. Click here to shop now. Shop for Shea Terra certified organic argan oil for only $24 from Beauty Sage. Click here for the skin repairing, anti-aging oil used for centuries. Get free shipping from Beauty Sage with purchases $25+. Click here to enjoy holiday savings. Shop at Beauty Sage and enjoy Proven Beauty Buys for under $30. Click here to shop.